Years ago, on a trip to Portland, Oregon with my wife and kids, I was browsing through a volume of nature photos in Powell's Books — possibly the world's largest independent bookstore. 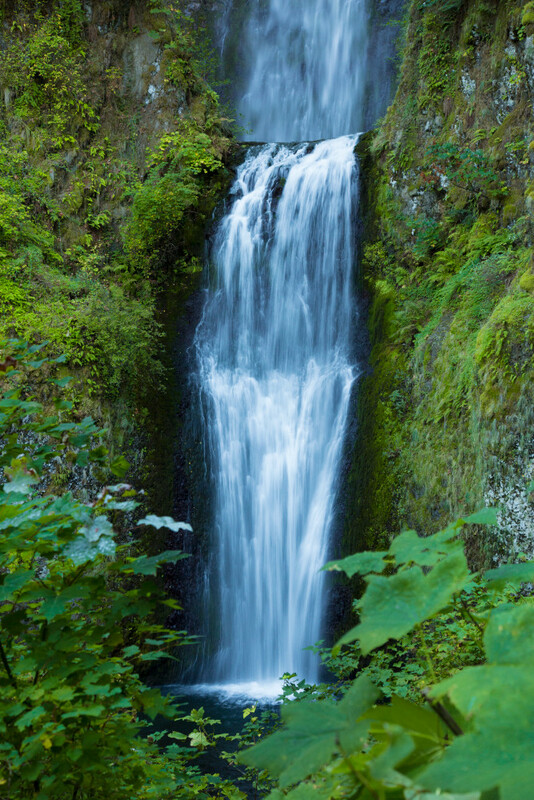 I came across a photo of Multnomah Falls, a huge, and hugely popular, waterfall. I took out my phone and Googled it — and discovered that it sits within the Columbia River Gorge, less than 30 miles from where I was standing. I asked the family if they wanted to come with me and they demurred, preferring to spend the time in a more urban environment — and not wait around while I composed dozens of photos. They encouraged me to go, however, and so I did. From the base of the falls, I took the requisite shots that everyone and their brother takes. With that out of the way, I went in search of more unique angles. I came away with a few shots I was vaguely happy with but resolved to return better prepared. Several years later, I did return, this time with my father on a trip specifically for taking photos. I brought a tripod and other photo accoutrements. Having scouted the site, I had some good ideas of what I wanted. Given that Multnomah receives a tremendous amount of visitors, it's virtually impossible to find a shot that no one else has taken. But I took advantage of the lush foliage and leaned off the trail a tad without actually leaving it. I shot through and around trees and came away from the expedition quite happy with my photos. I hope you are, too.